Noodles are one of the world’s most popular foods. Many ethnic groups have their own take on a classic noodle dish. The most well known include Italian spaghetti, Thai pad thai, and Japanese ramen. There are plenty of lesser known pasta dishes that different cultures cook every day. Personally, I have never met a pasta/noodle dish that I did not like. The amazing thing about all these dishes is that different parts of the world use widely different ingredients to create their basic noodles. In Europe, wheat is the most common base for pasta. In other parts of the world, eggs or rice might be the main ingredient in a noodle dish. More recently, health food stores have began to sell noodles that imitate traditional pasta, but are made up of healthier ingredients. This can include black bean pasta and lentil pasta. These alternatives to traditional pasta attempt to remake pasta to be low carb and healthier. We took at look at some of the most popular forms of noodles from around the world and compared their calorie counts. The amount of calories you eat is the most important factor of gaining or losing weight. When it comes to weight, nothing is as important as the amount of calories we eat. If you are attempting to lose weight, you will want to avoid noodles with the highest amount of calories. Likewise, if you are an athlete or someone who has trouble gaining weight, a high calorie noodle dish might be a great addition to your diet. Noodles can be a healthy part of any diet. Some of the world’s best endurance athletes live on pasta while competing. Cyclists that ride in the multi-day Tour De France end each day completely drained. To compensate they are given a big dinner that often revolves on a large amount of pasta. The pasta provides these athletes with the energy they need to recover and the calories that they will need to burn the following day. I know personally when I ride my bicycle for 100 or more miles, the two foods I crave most are ice cream and pasta. Basically, my body yearns for carbs, which makes sense because carbs are most quickly turned into energy by our bodies. So, depending on what your fitness goals are, here is a list of noodle types that you might want to add or remove from your diet. We will be comparing 8oz (56g) of each noddle type. The first image that comes to a lot of people’s mind when they hear the word ‘noodle’ or ‘pasta’ is classic red sauce spaghetti. The word ‘pasta’ refers specifically to Italian style noodles such as spaghetti, linguine, penne, etc. While these pastas have different shapes and thickness, they are all made out of the same base ingredients and all share the same nutritional value (by weight). Looking at the calories of pasta sauces can be a whole different post, here all we are looking at are the calories of the pasta itself. Italian pasta is made from durum wheat, but also contains thiamin, folic acid, iron, riboflavin and niacin. The noodles, without any sauce or oil or anything else contain about 100 calories per ounce, or 800 calories for an 8 ounce meal. This includes 56 grams of protein, 8 grams of fat and 336 grams of carbs. Egg noodles are similar to traditional pasta but they use more eggs. This makes egg noodles have a richer flavor. Egg noodles are often used in meat dishes like beef stroganoff. Egg noodles are also popular in Asian dishes such as chow mein. The use of more eggs make egg noodles have a bit more calories and a bit more fat. They also tend to have more cholesterol than regular pasta noodles. There is no hard rule for how many eggs to need to add to make regular pasta egg pasta. Because of this it is hard to say exactly how much fat all egg noodle brands will have. Just know that more eggs means more fat and more cholesterol, but also a richer flavor. 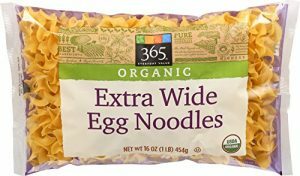 Again, this largely depends on the brand, but some egg noodles have around 880 calories, 56g of protein, 12g of fat and 328g of carbs per 8 ounces of dried noodles. The actual noodles in instant ramen are just Asian style egg noddles. You can refer to the egg noodle nutrition above to see how much nutrition ramen noodles have. Instant ramen noodles always come with a few packets of flavoring. These packets usually contain a lot of sodium, fat, MSG and dried veggies. They provide the flavor that makes instant ramen so good. They also increase the calories of instant ramen. 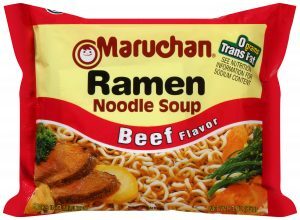 Because they are always sold together, the nutritional value of instant ramen is always calculated for the noodles and the flavoring packets. The packets add a ton of fat to the noddles. Because different ramen packets have such a variety of ingredients, the amount of calories and the nutritional makeup of different ramen brands can be very different from one another. 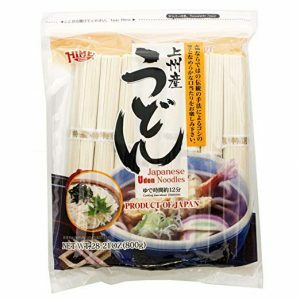 Udon noodles are a chewy Japanese noodle. Udon noodles consist of wheat flour, water and salt. Most of the time they are sold fresh, but you can find dried udon. Udon noodles have a little bit fewer calories than most other wheat noodles, but not by much. Soba is another traditional Japanese noodle type that is often served cold and eaten in summer. 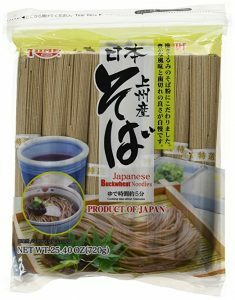 Soba noodles are made with regular wheat flour along with buckwheat flour. Rice noodles, as the name suggests, are made out of rice. 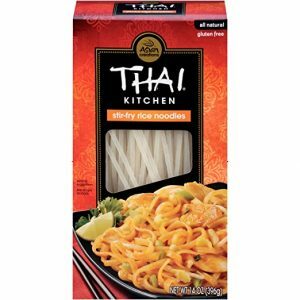 Unlike many other noodles on this list, rice noodles do not contain and wheat flour, and are therefore gluten free. These types of noodles are popular in Asian dishes, for example in pad thai or vermicelli. 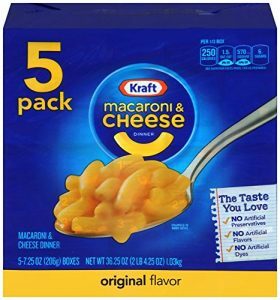 An American classic, Mac and Cheese is just regular wheat pasta noodles with a cheese mix and milk. The noodles themselves do not differ much from other pasta noodles, but the cheese sauce adds a bunch of extra calories. 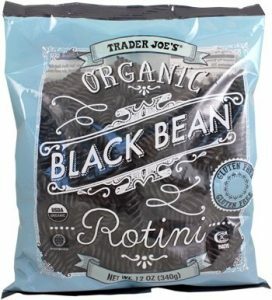 Pasta made from black beans or lentils have recently shown up on the shelves of Trader Joes. This pasta is made from beans instead of wheat, so it is gluten free. It tastes very similar to black beans (or lentils if you have the lentil variety), but the texture is similar to regular wheat pasta. Black bean pasta is made from black bean flour, which is basically just ground black beans. Surprisingly, the macro nutrients are pretty similar to regular pasta, with 8 ounces of black bean pasta containing around 800 calories. As you can see, most noodle types have a similar amount of calories per ounce. About 100 calories per ounce of dried noodles. To really start making a difference in how many calories you consume you have to look at different sauces, oils, and other additions to the noodle meal. If you are eating noodles, maybe worry less about what type of noodle you are using and worry more about how the noodles are prepared and what they are combined with. Instant ramen is not going to be as healthy as a spaghetti prepared with fresh tomatoes.